Having just returned from the BETT show in London’s docklands last week, it’s probably time to mention the Scan E-cast solution that we were demoing live at the show. 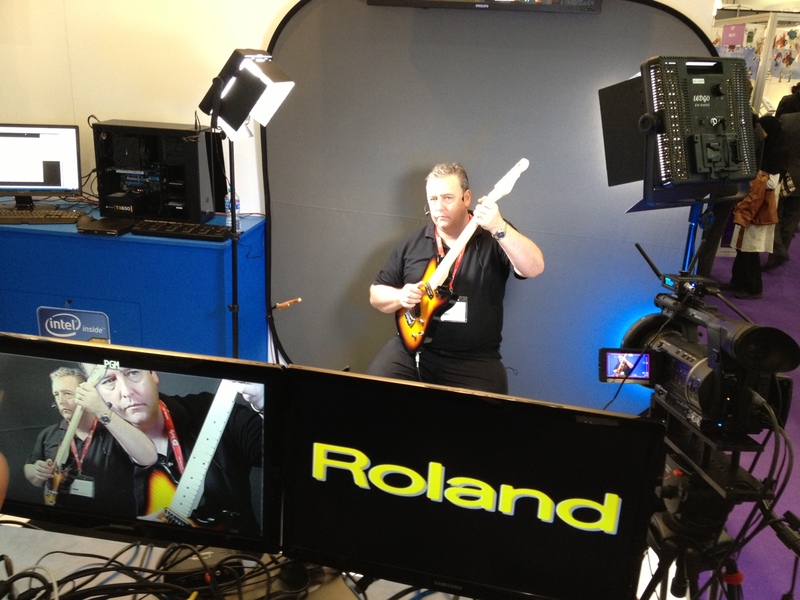 Together with Roland systems group, we were showing how easy it is to webcast using minimal equipment. The secret behind this is a cracking little piece of technology called the Roland VR3 box. Essentially, is allows you to video switch, audio mix, preview monitors and take advantage of streaming-ready USB output all in a single unit. 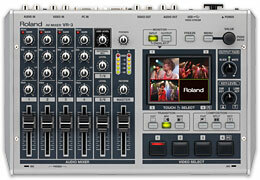 As a USB Video/Audio class device, web streaming is made easy by simply connecting to a computer running a live streaming service such as USTREAM , Livestream, Stickam, Justin.tv, worshipstream.com, websharelive.com, etc. OK, I here you say, but what does that mean to me? Over the next few years, webcasting will become more prolific. Already the greatest growth on You Tube has been tutorial lessons on musical instruments. However, with the advent of companies like Virgin Media including You Tube as a channel on your TV, viewers are becoming more discerning. They are calling for higher production values in the videos they watch. It’s no longer enough to see a murky figure, dimly lit, hanging off the edge of a grotty bed, teaching you the solo to “Stairway to Heaven”. Viewers want better quality, and if you’re a guitar teacher giving lessons over Skype for example, the same thing will apply, the better the quality or look of the lesson, the more people will subscribe. Using a piece of code, written by our own Tom ‘Autobot’ Francis, which uses a Midi switch pedal to control the VR3, the presenter is able to take control of which camera is seen by the viewer (very handy for switching to a close up of the left hand for example), they’re able to control what type of background is showing, spin in various jpegs or images, and control the wipes between camera changes. After a little practice, It’s possible to deliver a very slick presentation, controlling 2 or more cameras, and generally ‘upping your game’ in the video presentation stakes. The good news is, that although we were lucky enough to have some very high end cameras, pretty much any camera with a composite output will do. You probably have the cameras you need already, and things like the little Go-Pro cameras are awesome. 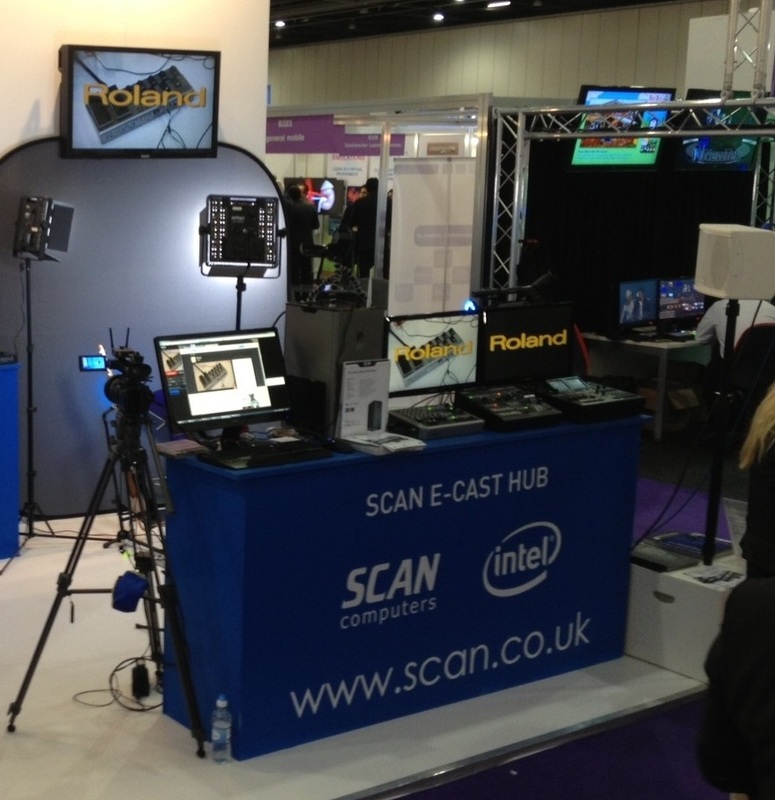 Working with our partners at Scan Pro Video and Roland Systems Group, we can provide you with a solution for something you didn’t even realise you needed! 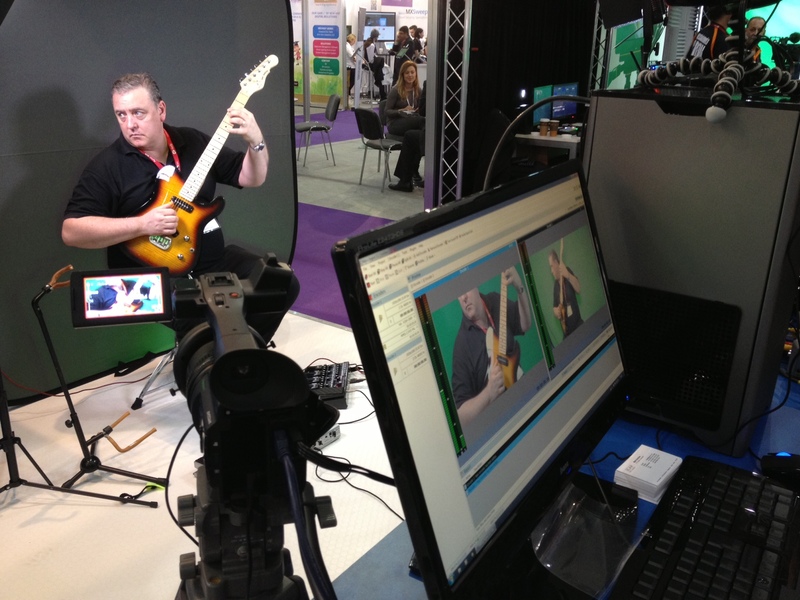 Take a look at some of the applications below…..
Skype lessons over the net. The SCAN E-Cast hub is an all-in-one solution to Web-streaming and Archiving. The Hub will enable your School or University to broadcast live to the web or to archive “Speciality Lessons”. Let’s say that you have a teacher or lecturer who has a great lesson on a particular subject. Using this Hub, they would be able to present the lesson and have it simultaneously broadcast to a URL, and/or be stored for use by future classes, extending the life and reach of the lesson content with on-demand versions. Imagine subject specific presentations by department heads, explaining which courses would be useful for various careers, and what the pupil’s could expect during the course. The teacher would have the opportunity to ‘sell’ their subject, and have it viewed by the children with their parents at home in their own time. Sports day, Prize Giving, Music Performances, Drama performances; All these can be streamed live to the Net, to be watched in real time by parents or invited guests. What about a visit from a ‘specialist’. Maybe a Poet or a Musician is coming to school. Capture a performance unique to your school. In conjunction with VOIP, a teacher could stay behind and run a Homework club over the net. Able to answer questions in real time from pupils who are tuned in to the relevant URL. An OFSTED requirement this year. The biggest increase in You Tube traffic has come from tuition videos on the web. However, viewers are becoming discerning, with the move from pc monitors to the living room and companies like Virgin Media featuring You Tube as a channel on your TV, the future will be higher production for private tutors on the net. We know the popularity of Podcasting, what about the move to Student TV?, or Lectures broadcast as standard to the web, so they can be watched from a sickbed. Drama workshops or performances streamed live to people who couldn’t make it to the show, or maybe in a BTEC environment, the Hub could be used to assess performance in Music and drama. More and more colleges and universities are use Webstreaming to record learning activities and campus events, and managing huge libraries of video-based instruction. Webstreaming can integrate with your existing classroom and campus systems to make it easy to teach courses online as well as in the Classroom. The truth is that this technology is the face of the future. Personalised digital content will be the way of the future, for everyone from families to teachers to rockbands, everyone will have their own outlet to present their ‘thing’ to the world…..